It was B's birthday last weekend so as a treat I booked us an overnight stay at the new Citizen M hotel in Glasgow. The hotel is on Renfrew Street just a 2 minute walk from the Buchanan Bus Station which was handy for us as we got a bus through from Edinburgh (so much cheaper than the train, and only took and hour an 20 minutes). 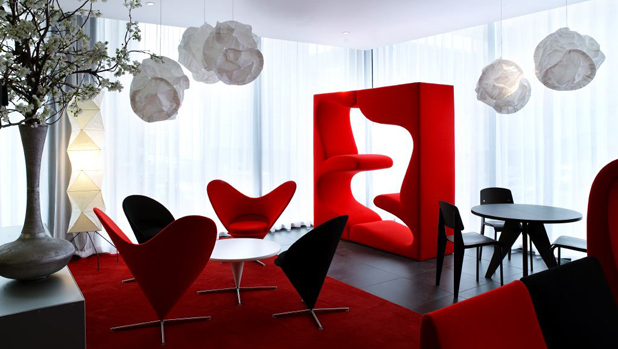 The hotel is super cool - everything is ultra modern and slick, styled in black and red, with cool gadgets everywhere. Check in is via touchscreen (there was a member of staff on hand to help) in the very funky lounge / "living room" area on the 1st floor. Now for the room itself....the bed is HUGE- it takes up half of the room and fits wall to wall, with a window making up the third side. It was soooo comfy, which I think it why I managed to sleep for about 10 hours straight! Everything in the room is controlled by one remote - from the TV (including an extensive free movie database), to the coloured lighting, to the air con/heating and the window blinds. It was like being in the future! The bathroom set up took a bit of getting used to - the shower and toilet are in a closed off area near the door with frosted glass on all sides (as you can imagine this means there is next to no privacy...so I wouldn't advise staying here with a boyfriend unless you are past the being embarassed about using the toilet stage!). The sink however is outside this glass area, in the main bit of the room (although there is a curtain you can pull over to split the room in half) - it felt quite weird washing my face whilst still being able to watch the TV, haha! In the evening we went out for dinner at Paperinos in the city centre - we'd been to the West End one a few years before when B booked me a surprise trip for my birthday, so when I saw they'd recently opened up a new restaurant I thought we should give it a go. The meal was lovely, although I did end up regretting going for the 3 courses as I was completely stuffed afterwards! Once we got back to the hotel we got a drink from the bar (vodka for B, cocktail for me) and had a wander round the living room area and a sit down in various cool chairs. Then it was back up to the room for the final Thick of It and then The Change Up (I thought it was really good, but B fell asleep so not sure he liked it that much!). I don't do OOTD posts on here very often (mainly because I don't have time in the mornings to take pictures of what I'm wearing as I'm always in a rush) so here's some rare outfit and face of the day photos! They were taken on my iphone so the quality isn't great I'm afraid. Overall I really enjoyed our short little weekend away - I absolutely LOVED the hotel, it's exactly the sort of place I love to stay, modern, huge comfy bed, and lots of gadgets! We are actually thinking of going there for a quiet New Years Eve just the two of us, so I might be back soon!